There is no doubt that Google knows everything about us. We use their services, grant them access to all of our search history, and all that we ask in return are for services that help make our lives more simple. 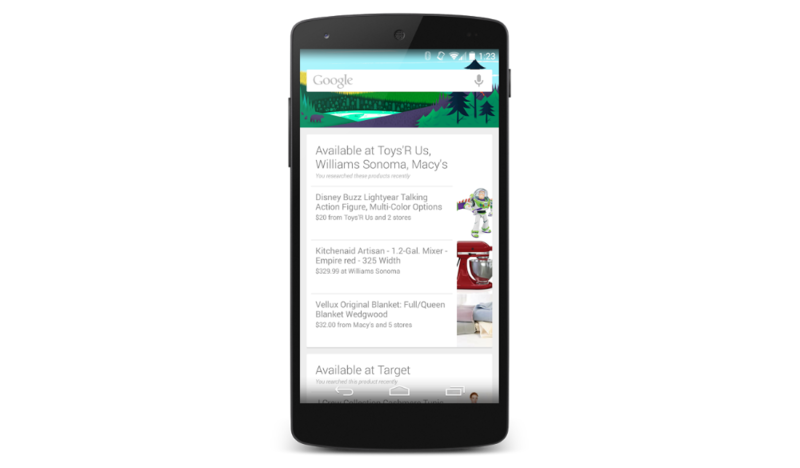 Lately, Google has been adding more cards to Google Now, to help with the simplifying of day-to-day tasks, and today the company has announced yet another card which is perfect for the online window shoppers among you. Once you have updated to the most recent version of Google Search, Google will begin reminding you of products you have once searched for, all while you are out shopping at a particular store that carries the item you were looking at online. Only semi-creepy, right? For example, if you were looking online for the new Godzilla figurine to put in your man cave, but didn’t exactly know how big it was so you decided not to purchase, the next time you are in Toys “R” Us or near a location that stocks that particular Godzilla toy, Google Now will show you a card about it. The same goes for clothing and any other product that you might search for online that a retailer would carry in store. You can go grab the updated Google Search app from Google Play by following the link below.